The first Western civilization known to have developed the art of navigation at sea were the Phoenicians, about 4,000 years ago (c. 2000 B.C.E. ). Phoenician sailors accomplished navigation by using primitive charts and observations of the Sun and stars to determine directions. 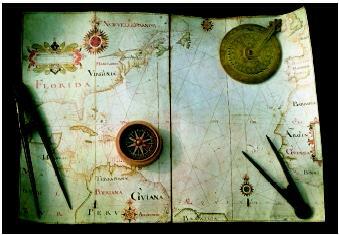 Maps, compasses, astrolabes, and calipers are among the early tools used by ocean navigators. In the modern era, these tools have been largely replaced by electronic and technological equivalents. Despite these early beginnings, it would take many centuries before global navigation at sea became possible. Until the fifteenth century, mariners were essentially coastal navigators. Sailing on the open sea was limited to regions of predictable winds and currents, or where there was a wide continental shelf to follow. Farther ventures were enabled by the development of scientifically and mathematically based methods and tools. Determining latitude can be accomplished relatively easily using celestial navigation. In the Northern Hemisphere, mariners could determine the latitude by measuring the altitude of the North Star above the horizon. The angle in degrees was the latitude of the ship. One of the earliest human-made navigational tools used to aid mariners was the mariner's compass, which was an early form of the magnetic compass. Early mariners thought the mariner's compass was often inaccurate and inconsistent because they did not understand the concept of magnetic variation, which is the angle between true north (geographic) and magnetic north. It was primarily used when the Sun was not visible to help identify the direction from which the wind was blowing. Astrolabe, Sextant, and Chip Log. 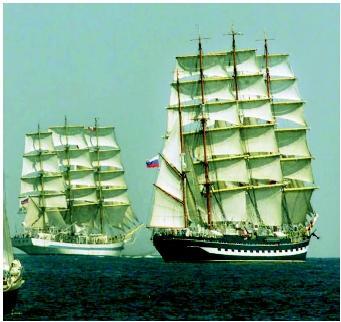 Tall ships keep alive the history of ocean navigation. Today, ships such as these call to mind images of merchant ships from long ago and pirates in their heyday during the eighteenth century. fifteenth century. It was used to measure the altitude of the Sun and stars to determine latitude. Around 1730, an English mathematician, John Hadley (1682–1744), and an American inventor, Thomas Godfrey (1704–1749), independently invented the sextant. The sextant provided mariners with a more accurate means of determining the angle between the horizon and the Sun, moon, or stars in order to calculate latitude. During the sixteenth century, the chip log was invented and used as a crude speedometer. A line containing knots at regular intervals and weighted to drag in the water was let out over the stern as the ship was underway. A seaman would count the number of knots that went out over a specific period of time and the ship's speed could then be calculated. Throughout the history of navigation, latitude could be found relatively accurately using celestial navigation. However, longitude could only be estimated, at best. This was because the measurement of longitude is made by comparing the time-of-day difference between the mariner's starting location and new location. Even some of the best clocks of the early eighteenth century could lose as much as 10 minutes per day, which translated into a computational error of 242 kilometers (150 miles) or more. In 1764, British clockmaker John Harrison (1693–1776) invented the seagoing chronometer. This invention was the most important advance to marine navigation in the three millenia that open-ocean mariners had been going to sea. In 1779, British naval officer and explorer Captain James Cook (1728–1779) used Harrison's chronometer to circumnavigate the globe. When he returned, his calculations of longitude based on the chronometer proved correct to within 13 kilometers (8 miles). From information he gathered on his voyage, Cook completed many detailed charts of the world that completely changed the nature of navigation. In 1884, by international agreement, the Prime Meridian (located at 0° longitude) was established as the meridian passing through Greenwich, England. The twentieth century brought important advances to marine navigation, with radio beacons, radar, the gyroscopic compass, and the global positioning system (GPS). Most oceangoing vessels keep a sextant onboard only in the case of an emergency. The gyroscopic compass (or gyro compass) was introduced in 1907. The primary benefit of the gyro compass over a magnetic compass is that the gyro is unaffected by the Earth's, or the ship's, magnetic field, and always points to true north. The first practical radar (short for "radio detection and ranging") system was produced in 1935. It was used to locate objects beyond range of vision by projecting radio waves against them. This was, and still is, very useful on ships to locate other ships and land when visibility is reduced. The U.S. navigation system known as Long Range Navigation (Loran) was developed between 1940 and 1943, and uses pulsed radio transmissions from so-called "master" and "slave" stations to determine a ship's position. The accuracy of Loran is measured in hundreds of meters, but only has limited coverage. In the late twentieth century, the global positioning system (GPS) largely replaced the Loran. GPS uses the same principle of time difference from separate signals as Loran, but the signals come from satellites. As of 2002, the system consisted of 24 satellites, and gave the mariner a position with accuracy of 9 meters (30 feet) or less. SEE ALSO Cook, Captain James ; Geospatial Technologies ; Transportation . Rosenbach Company. The Sea: Books and Manuscripts on the Art of Navigation, Geography, Naval History, Shipbuilding, Voyages, Shipwrecks, and Mathematics, Including Atlases and Maps. Storrs-Mansfield, CT: Maurizio Martino Publishers, 2003. Sobel, Dava. Longitude: The True Story of a Lone Genius Who Solved the Greatest Scientific Problem of His Time. New York: Penguin USA, 1996. Thurman, Harold V. Introductory Oceanography, 7th ed. New York: Macmillian Publishing Company, 1994. Toghill, Jeff E. Celestial Navigation. New York: W. W. Norton & Co., 1988. Boat Safe Kids: The History of Navigation. International Marine Educators, Inc. <http://www.boatsafe.com/kids/navigation.htm> . The Age of Exploration. The Mariners' Museum, Newport News, Virginia. <http://www.mariner.org/age/index.html> . This web pae helped me alot with a school asignment. Thank you very very much! This information really helped me out a lot, thank you!